I chose to paint my favorite playlist in the display. This gives it that extra attention to detail that I like to pay extra attention to. Clair de Lune is highlighted as the first song. The background is the classic Apple-esque white with a subtle shadow. The battery indicator shows that it's charged and ready to go! 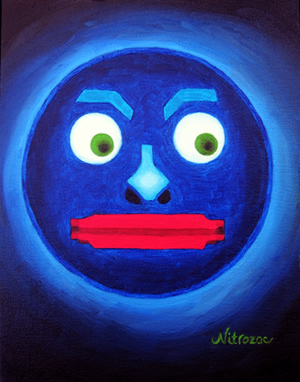 So, get ready to go and bid on my iPod's portrait! As a painting of The Dock Painting Series, it can stand alone or you can collect them and place them next to each other to create the effect of the Dock on your wall! Cool, eh? I can't wait to paint the next one! Go now, and rev up the bidding! Good Luck! 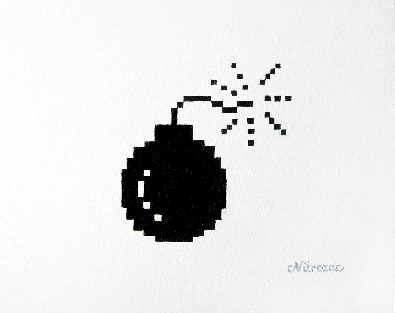 The original bomb icon was designed by the icon design genius, Susan Kare. Many Mac Geeks are fully aware of this and other icons that went hand in hand with all things Macintosh. It is with this sense of nostalgia that I painted "Mac Bomb". It also is quite a striking image, I must admit. It says so much in just a few pixels, or in this case, a few brush strokes. It was a challenge to paint as well, all those straight edges of tiny squares. Since the painting is black and white it will fit into any decor quite nicely, especially a Mac Geek's decor. 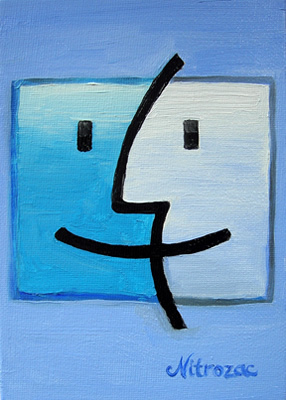 It's a classic oil painting of a classic Mac symbol, I'm quite in love with it actually. Snaggy and I also did a comic about the Red (PRODUCT) for the Joy of Tech. 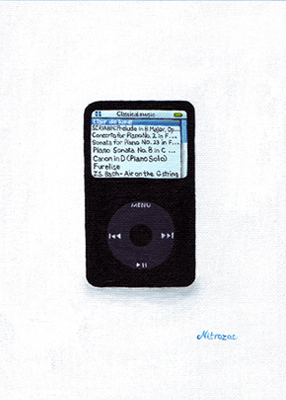 I don't think there are too many paintings of iPods out there. 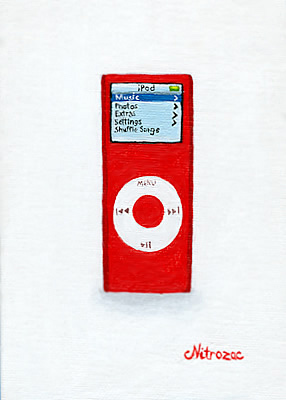 This would definitely be the first Red iPod painting up for sale, in the whole world. It's always fun to be first, don't you think? Also, it makes you feel good to know that you're doing something to help while buying stuff! 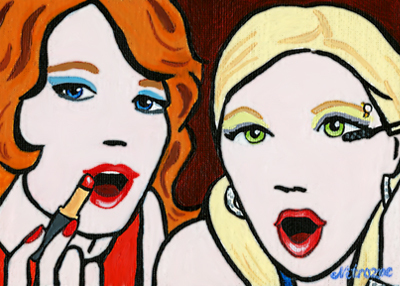 I felt great while painting it, and hopefully, you'll feel great while bidding on it. 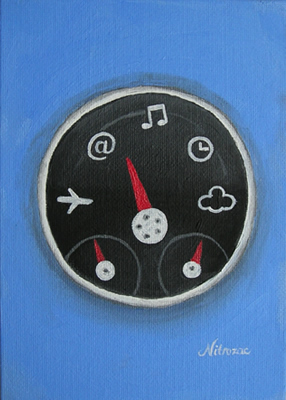 The painting is a 5" x 7" acrylic painting on canvas board. The iPod is depicted life-sized. Cool, eh? Just an update, for those wondering how we are going to pay The Global Fund, since eBay.ca doesn't have the pay-to-charity option like eBay.com does. We'll be paying them directly, or, if the buyer is from the USA and so wishes, they can pay the Global Fund directly and get the tax-deduction. We won't be receiving a tax deduction, and we will be covering the eBay.ca fees ourselves, and the shipping fee too. So in other words your full bid will go to The Global Fund. Fund to Fight AIDS, Tuberculosis and Malaria. (In this fashion, your donation can be tax-deductible). Thank you for your generous gift in the amount of $365.00 to the United Nations Foundation in support of the Global Fund to Fight AIDS, Tuberculosis, and Malaria. Your gift will be used to support research, fund prevention efforts, and provide care to people living with these three diseases. By asking the UN Foundation to be custodians of the Global Fund, Secretary-General Annan recognized the need to nurture collaboration from all sectors of the international community: no small task, but something the UN Foundation is honored to help support. Only through partnerships between the public and private sectors, both internationally and domestically, can we as a global society expect to combat a public health epidemic that has already taken so much and threatens millions more. We hope you'll continue to visit www.unfoundation.org for updates on the work of the UN Foundation and our partners. Thank you once again for your support – together, we can make a difference in the lives of those who need us most. In compliance with United States Internal Revenue Service requirements regarding charitable donations, the UN Foundation affirms that no goods or services have been provided by the Foundation to you in consideration for your contribution. Please retain this letter as proof of your gift for federal income tax purposes. With the release of OSX, Apple has replaced the Happy Mac boot-up image with the Apple Logo. That was a very sad day for many of us Mac Geeks who have real feelings about seeing the Happy Mac face. The Happy Mac image was also functional, it was the way your Mac would let you know how it was feeling; Happy Mac for when everything is going good, Sad Mac when it's not so good, even a Dead Mac for when things have gone horribly wrong. As you can imagine then, seeing the Happy Mac would be quite welcome. I feel this painting will give its owner that same, reassuring feeling that everything is going to be ok. It can also bring back fond memories of working in previous OS's, like OS 9. Ah, those were the days, somehow things seemed to run faster in the other OS's ;-). 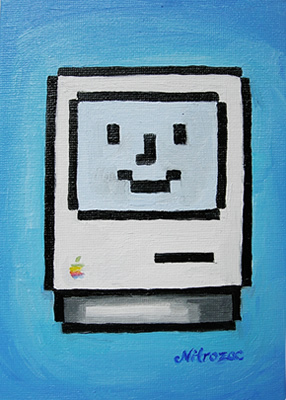 "The Happy Mac" is the 6th painting to appear on my Painting A Day Blog. I also have a comic about the day Apple discarded the Happy Mac on our site, the Joy of Tech. 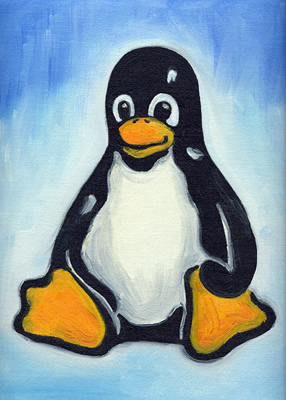 The oil painting is a cute size of 5x7 inches, sure to fit any wall or shrine to the Mac. I wish you a very Happy Mac bidding! JoT (Joy of Tech) fans know, I do enjoy drawing attractive females in my comics whenever I get a chance. I thought painting JoT babes might be fun too, and it was! I'm happy with how it turned out, it's a bright and cheerful painting, you can't help it but smile when you look at it. I hope it'll make you smile when you look at it on your wall. Joyous Bidding! Everybody has pictures of family, and pets in their workspace, that's boring! Why not think different, and have a real painting of your favorite CEO? You'll be the envy of the entire office! 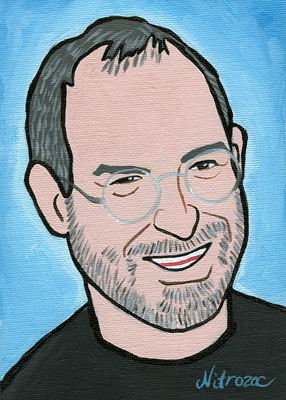 There is no other place in the world you can get an original painting of Steve Jobs. It's not the kind of thing you can just go to Ikea and buy in the wall decor department. It's not some file anyone can print off in an inkjet printer! That's so common. You can see and touch the brushstrokes, the colors pop out, and the resolution is beyond anything an inkjet printer could ever acheive, it's infinite dpi! The resolution is as high as it physically can be! That alone is something to observe and marvel. You can find several comics starring Steve Jobs at The Joy of Tech. Recently, the International Astronomical Union demoted dear, sweet, little Pluto, causing an outcry of sadness and grief among star gazing geeks, myself included (see the comic Snaggy and I did about it in The Joy of Tech). Even Clyde's widow said she was upset! What kind of monsters would upset a nice little old lady! Don't they have anything better to do than recategorize space objects?! Is it that bleak out there in the space discovery business that they have to pick on the little guys?! 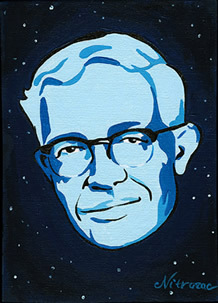 It is my honour to paint Clyde Tombaugh, and I hope that the new owner of this painting will appreciate Clyde's beautiful contribution to astronomy and our geeky world. May it inspire you to look at the stars and love all the objects in the sky, whether they're big giants or tiny planets, they all have a story to tell if you're willing to listen.